The town of Armentières was in Northern France, just short of the Franco-Belgian border. It was reached by British troops in October 1914 and trench lines established east of the town which would hardly move until 1918 – in fact they only moved at the time this German aerial photograph was taken during the Battle of the Lys in April 1918. The Battle of the Lys was one of the final German offensives of the war and launched in Northern France and Flanders on 9th April. Armentières was assaulted with mustard gas and was abandoned, not re-taken until September 1918. 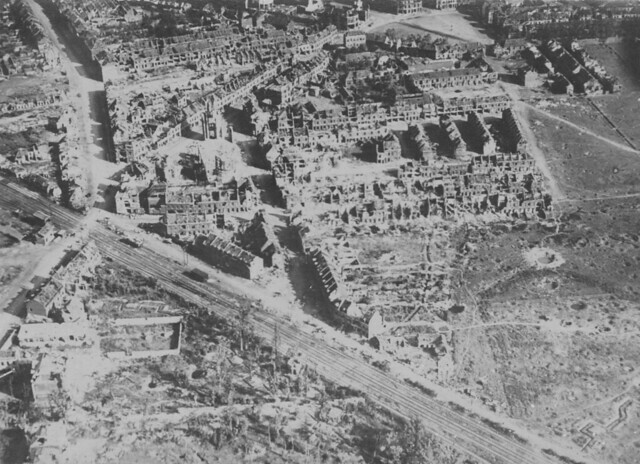 By that stage it’s buildings, many of which survive as this photo from Spring 1918 shows, were now in ruins and it became part of the Zone Rouge – the devastated area of France. Although the scene of heavy fighting, Armentières was much more famous for the Great War song Madamoiselle from Armentières. First recorded in 1915, it was arguably one of the greatest ‘hits’ of the war and a song forever associated with the generation of WW1.